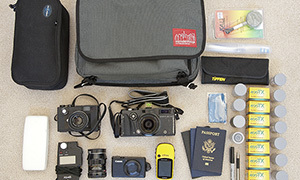 A travel bag today, as Bill shares the gear that he took with him on a recent trip to Europe. 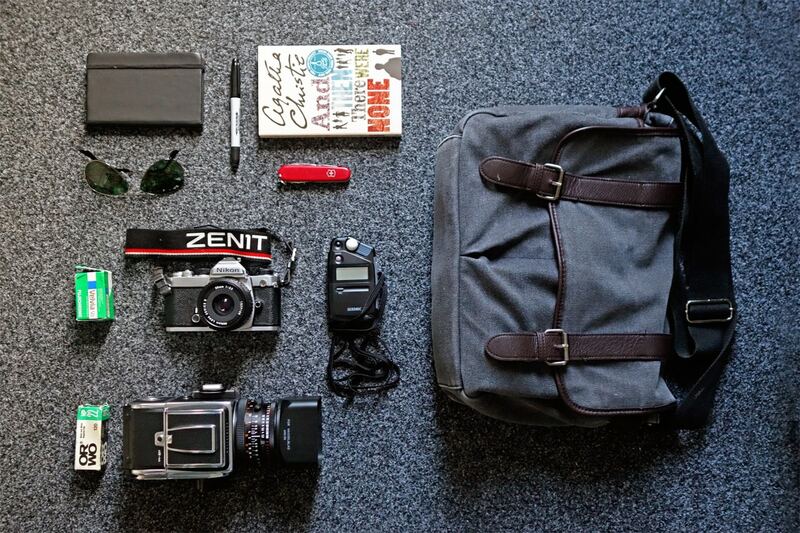 Including one of my favourite travel cameras. Check it out. My name is Bill Allen (no relation to the former photo editor at National Geographic). 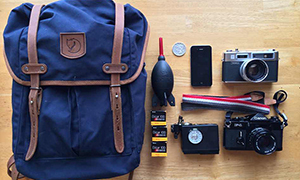 Your site is a great inspiration to keep photography simple and enjoyable. My love of photography started off in college while shooting for Student Publications at Georgia Tech. Those were the days when the photo editor would throw you an assignment and a couple rolls of Tri-X. As graduation approached, I made the switch from film to Nikon digital. Ah to shoot with a Nikon 85/1.4 again. Anyway, about a year later I switched again, to Canon digital. Not looking to start a war here; this was way back in 2005 when Canon was dominating low-light photography. For a few years after that I worked (very) part-time shooting sports for US Presswire in the Baltimore/DC area. These days I’m living in Denver. I’ve learned to slow down, carry less, and enjoy taking the photos I want to take. I’ve since purchased a Hasselblad Xpan, and my wife’s grandfather’s Leica kit which contained an M6, CL, and nine lenses. In spite of all that Leica gear, I keep finding myself going out with just the M6 and 35/2. And I will always be in love with the Xpan. It’s positively cinematic. My favorite places to shoot are big cities like New York, Paris, etc., but I love to travel so I’ll go just about anywhere. Even when I’m not traveling, I like to think that there are always 10 great photos within 10 yards/meters of wherever I’m standing if I just take the time to look. 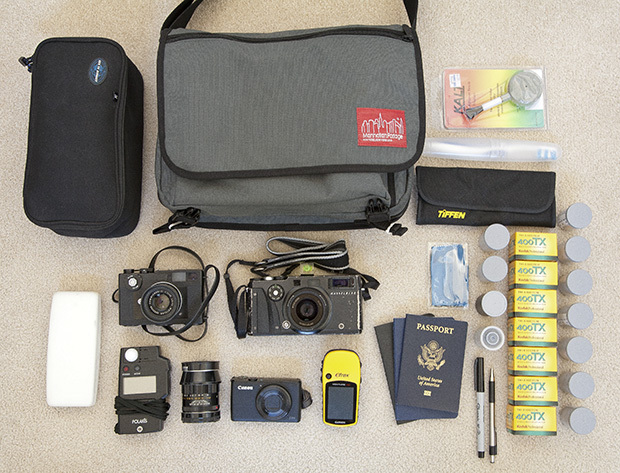 The bag photo attached to this e-mail is from a recent trip through Europe. I flew into Paris, took trains through southern Germany, then flew out of Venice. It was the first trip in a while where my primary cameras were film instead of digital. I still brought a digital point-and-shoot to fill in the gaps (for all the bad photos). Hasselblad Xpan, because I just couldn’t resist the urge to take it, even though it’s really heavy. Leica CL, because I wanted to take a Leica, and it’s lighter than the M6. Leica 90 f/2.8 Tele-Elmarit, for a little more reach, or in case someone needed a portrait taken (no one did). Canon S95, for all the stoopid pictures in bad light, plus it can shoot video. Polaris light meter, because camera light meters can’t always be trusted. 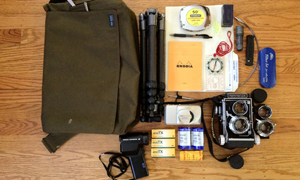 Sea to Summit Soft Cell, otherwise known as the Xpan Go Bag. These days it’s more organized thanks to the Tiffen filter case to the right. Manhattan Portage Europa Medium Messenger Bag, because it’s lightweight, well made, looks sharp, and can swallow a ton of stuff when expanded. It even had room for a music box on the return trip. 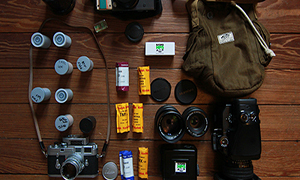 Nine rolls of Kodak 400TX (Tri-X), which is my go to black and white film with lots of latitude. Seven rolls of Kodak Portra 400, which I mainly planned to use in the Xpan. It turned out that Venice was very colorful though, so I did the unthinkable and put color film in the CL as well. One roll of Fuji Pro 400H, which has been sitting around since before I switched to Portra. One roll of Ilford FP4 125, in case I wanted to shoot some higher quality black and white. Kalt Blower Brush, for the battle against dust. Thankfully there are no worries about dust on the sensor when you use film. Garmin eTrex Venture HC, so I’d know where I’d been. It’s also fun to post far-away places on Strava. Extra pair of glasses (in the white case), so I’m not completely helpless if something happens to my main glasses. Really they’re just the glasses from my previous prescription; better than nothing. Toothbrush, because I’m paranoid like that. Thanks for sharing your bag with us Bill. Wow, you even managed to pack a toothbrush, that is very Japanese. Bill, that Limousine pan photo is perfect. Thank you, Zach. The limo, the limo cover, and the Xpan all just kind of came together that day. The funny part is that I’d walked all over that area taking pictures, and when I was just about to hop in my car to leave, I turned around and saw the limo. It’s fun to take the long way though. Amazing photos Bill! I think the Pano pics are awesome, and there’s a consistency between them – definitely your “style” , if you will. Keep it up! Thank you, Nick. I’m glad you think I have a consistent style. Photographers are rarely good at editing their own photos. One day I hope to have enough good, consistent photos to put together an Xpan book. Right now though, the Leicas are providing an enjoyable distraction from the Xpan though. Those xpan shots are magnificent! You’ve inspired me to find some more out about this camera, my G.A.S. is going off the dial!